Radiofrequency ablation, also referred to as lesioning or radiofrequency neurotomy, is a minimally invasive procedure which is used to help reduce joint pain, either felt in the neck or the back. It can also help those who are suffering from arthritis and even those with varicose veins. During the process, an electrical current created by a radio wave heats up the affected nerve tissue in a way so that the nerves decrease its pain signal transmission to your brain. The cost of radiofrequency ablation will greatly depend on the professional you choose and your geographical location. From our research from those who provided the prices they paid online, health insurance almost always never covers the procedure, meaning you will either have to pay cash out of pocket or even setup up a payment plan with your provider or a third-party source. With that being said, be prepared to pay anywhere from $2,200 to more than $5,100, with the results of the procedure lasting about one to two years. According to the providers who listed their prices on MDSave.com, the MDSave national average was $2,476, in comparison to the estimated national average of $5,203. Before the procedure day, your doctor will more than likely ask you to avoid eating for up to six hours, and in the case of diabetes, you may be asked to limit your medication as well. In most cases, your doctor will ask for a medication list ahead of time and will let you know exactly what you will be able to take and when you can take it. You will also be asked to bring a friend/family member along so they can drive you after as you will not be able to drive due to the sedative used during the procedure. The entire procedure is done on an outpatient basis and should not take longer than 90 to complete, from start to finish. It only requires a mild sedation and local anesthetic, meaning there are fewer risks when compared to the general anesthesia used during an open surgery process. Prior to the procedure, your doctor will first want to inject a local anesthesia, such as lidocaine, to determine which nerves need to be ablated. This is done by placing an IV line into your arm and depending on your situation, a mild sedative could be used to help reduce your discomfort. Next, the physician will inject a fine needle into the area where you’re experiencing the pain. As with most spinal injections, the entire procedure is performed alongside a live x-ray (fluoroscopy) to both help target and place the needle during the process. Once the needle is inside the targeted area, a microelectrode is inserted to start the stimulation, and as this is happening, your physician will ask you if you’re feeling any sort of tingling sensation as this can help see if the electrode is in the best area for treatment. When verified it is in place, a tiny radiofrequency current is directed through this electrode and is designed to cause the tissue to warm up, eventually limiting your pain. To learn about the basics in general, PainDoctor.com created a nice guide talking about the basics of the procedure. When the procedure completes, you will then be sent to a recovery/waiting room, where an assistant will check your vitals such as your pulse and blood pressure. Next, a gauze will be applied to the site and your doctor/nurse will go over the discharge instructions before they allow you to go home. These instructions generally tell you to limit your driving and activities for the next 24 hours and avoid taking a shower/bath for the following 48 hours. As long as your vitals are okay, you will usually be sent home in less than 30 minutes after the procedure was performed. The main side effects, as per WebMD, can include swelling and bruising at the site of treatment, discomfort, leg numbness, and/or bleeding and/or an infection at the injection site. However, even if you were to experience these side effects, most will disappear days after the procedure was performed. If you do feel any severe pain near the injection site and notice redness and/or swelling, call for help immediately to check for complications. The procedure has been known to provide relief for those who are suffering from nerve-related pain, and clinical studies have shown that RFA can reduce pain for up to two years. However, as the nerves generate over time, the pain can return in the future, making it feel as if you never had the procedure in the first place. WebMD.com says the degree of pain relief will vary, depending on the cause, but relief from RFA, in most cases, can last six to 12 months, with more than 70% of patients who took advantage of it stated they did experience relief. RFA is said to be safe and can be considered the most effective way to treat pain. With few complications, it is well tolerated by most, and the risks are very low, with infection and bleeding at the injection site being the most common. Always talk with your doctor in regards to the risk of the procedure. 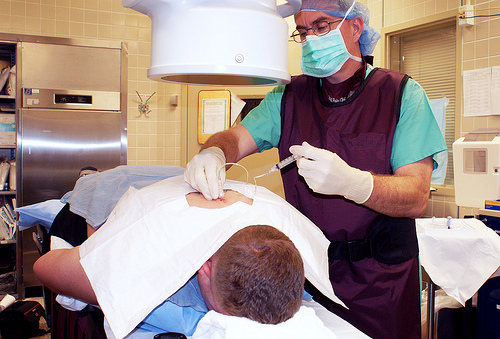 Radiofrequency Ablation is not recommended for all patients, as with any medical procedure. If you experience bleeding problems and/or have an active infection, then your doctor will not recommend it.